ATR #102 – The lost episode with Tim, Jess, and Damien! Episode 102 has been resurrected from the ashes of a corrupted memory card and brought to you this week! 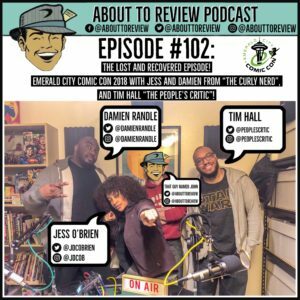 This was the episode that was recorded the weekend of Emerald City Comic Con 2018 with Tim, “The People’s Critic” and Jess, and Damien from “The Curly Nerd Podcast”. I truly thought this episode might not ever be heard, and I am so grateful that it was recovered! All three of the people on this episode are some of my best friends and now you can digitally hang out with us as we geeked out over a con. Make sure to stick around at the end of the episode for some bonus content! If you want to support the show, there are now more options! Click here for the – Amazon Wishlist. This list has a few items that would help out the studio. Click here for the – Threadless Store. Pick up a T-Shirt or coffee mug to show your support! Click here for the – PayPal Link. If you are feeling super generous and want to pitch in a dollar, great! 1h:04m – 1h:12m: Extra special bonus content from the cutting room floor! Thank you so much to my friends who were the amazing guests on this episode! Make sure to follow this podcast social media!